If you are interested in chess, you can enjoy it even if you don't have the time to play one or two games every evening. Fortunately, the chess players around the world have produced a wealth of beautiful games that you can reproduce over the chessboard. That's great fun, believe me. But all the games may not be equally interesting, unless you are a strong player with a good understanding of the finer points of the game. For an average chess lover, the ideal games to dig into are the ones where a lot of things happen. Attacks or counterattacks can be very exciting, particularly when sacrificial combinations are there. Have I begun to sound a bit too technical? Don't worry. A combination is nothing but a series of moves which makes the opponent respond in a forced way and its purpose is either to checkmate the enemy king or to make material gain in the end. Again a hazy explanation? Well, a combination is a powerful attack. Clear? What makes a master's combination different from yours (Sorry, I am not talking to a brilliant attacking player) is its ruthless accuracy. You have to see very clearly through the maze of complexities which occur when your are exploding that bombshell on the enemy position. One of the most exciting things that can ever happen on the board is a queen sacrifice. You would definitely like to give up the queen when a mating attack is available. At times, the grand coup might take only a few straight moves, but it can be a length process also. In the game below, White drags the black king out in the open and finally the lovely move 18 K-d2 ends His Majesty's perilous journey on a tragic note. See how the black army helplessly watches the king travelling to the other end of the board on a fatal mission! The game was played in London 92 years ago! But, remember, time cannot spoil an object of great beauty. 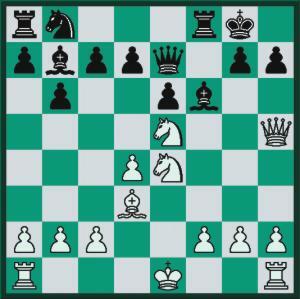 1d4 f5 2 e4… The Staunton Gambit, which once nearly put the Dutch out of commission, but much better ways of handling the black position have since been found. 2..fe4 3 Nc3 Nf6 4 Bg5 e6 5 Ne4 Be7 6 Bf6 Bf6 7 Nf3 0-0 8 Bd3 b6 9 Ne5 Bb7 10 Qh5 White is playing for a direct attack on the enemy king. 10..Qe7 Black completely misses the point of White's last move. Now comes the deathblow! 11 Qh7+ Unbelievable though it may sound, this queen sacrifice leads to forced mate! 11.. Kh7 What else? 12 Nf6+ Kh6 13 Ng4+ Kg5 14 h4+ Kf4 15 g3+ Kf3 16 Be2+ Kg2 17 Rh2+ Kg1 18 Kd2 mate. Yes, you are right18 0-0-0 would have done the same damage.